Ohineri is coins wrapped in paper which is thrown onto the stage when the actors appear the stage or snap into a mie pose.You won't see them in professional kabuki, but it is a vital part of ji-kabuki scenery. 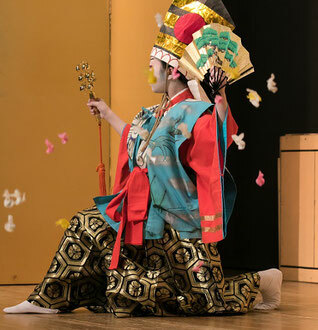 To celebrate the performance of a favorite actor or even one's own child, small coins are wrapped in paper to make lots of o-hineri on the day before a ji-kabuki performance. The look on an actor's face when o-hineri come flying from the audience is priceless. Take a bag of o-hineri with you when you go enjoy a ji-kabuki performance! If the o-hineri is too light, it won't fly correctly, so be sure to use heavy coins. As for the paper, origami size works best, and the thickness and firmness of copy paper is just right. If the paper is too thick it becomes hard to wrap, but it it's too thin the paper will break, so be careful. Use colorful paper for a showier effect. Place the coin on the paper. Gather the coin at the center of the paper, and pinch it to make a bundle. Finally, twist the pinched section and you're done. O-hineri aren't necessarily thrown on stage with precise or regular timing. When the intended actor performs an impressive feat or strikes a mie pose, throw a handful of o-hineri on stage at your own discretion. However, try not to hinder an actor's performance. If thrown during an actor's speech or aimed directly at an actor, it can break their concentration. 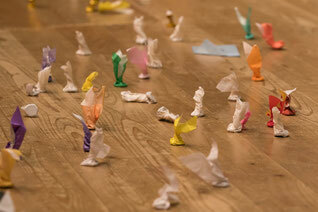 O-hineri are known as "flowers that support actors", so try to throwing them to help enliven an actor's performance.